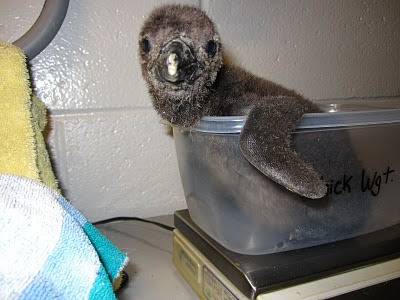 You may have read in a previous blog post that some penguin chicks recently hatched here at the Aquarium. These chicks are being raised by their parents behind the scenes. They are fed by their parents who regurgitate (or throw up) fish to the chicks. Since penguins in the wild transport food to their nests over long distances it is impractical for them to carry fish around in their beaks. Penguins can keep a partially digested fish puree in their stomach for several days before being regurgitated. They have special enzymes in their stomach that inhibit bacterial development even though the fish is at body temperature. To make sure the chicks are well fed we make sure the parents are well fed by offering them food multiple times a day. (Learn what our penguins eat here, and see video of feeding time in the main exhibit here!) We also will weigh the chicks every other day to monitor their growth. It's time for a weigh-in! For the weigh-in, we carefully remove the chick from the burrow and its protective parents for just the few minutes it takes for us to place the little guys on the scale. (We use a similar technique when checking the eggs during the incubation period and when they're pipping. Learn more about these stages of chick development here and here.) Then it's right back to mom and dad! Check out this time-lapse video montage of us weighing some of our chicks. 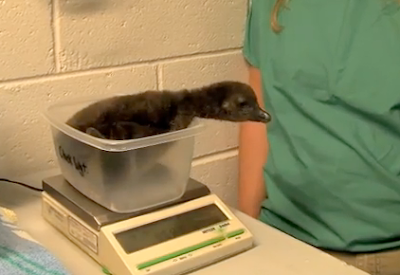 When it is born, an average African penguin chick weighs about 70 to 80 grams (that's less than ¼ of a pound). They will continue to grow until they reach their adult weight which usually is around 2500 to 3000 grams (or 5 to 7 pounds). As you might have noticed in the video, we have to constantly use bigger and bigger containers to weigh the chicks in as they continue to grow! The penguin chick has a name! Free penguin lecture for the public!